Lavender (Lavandula) is one of our favourite aromatic garden plants, and indeed it is used widely all over the world as a garden plant, hedging plant and as a commercial crop. It has to be one of the most adaptable and hardy plants available for sale. Originally from sunny Italy, Greece and surrounding areas lavender grows well in just about any climate as long as it receives lots of sun and is in a well drained soil. And speaking of soils, it is not that fussy, poor soils are OK. So the secret to growing lavender is out, sun and a well drained soil, it is really that simple. With many Lavender varieties and cultivars found growing in gardens and farms around the world. Used as a hedging plant and also popular flowering plant in cottage gardens (see picture above right), Lavender is also grown to harvest for its flowers and essential oils. Lavandula x intermedia grosso, Lavandula ‘sumian’ grosso and Lavandula x intermedia provence are all popular varieties. Lavender types for sale include English Lavender, French and Spanish lavender as well as Lavandula canariensis (Canary Island Lavender). How tall will they grow ? between 30cm and 90cm depending on variety and cultivar. One of the most fragrant lavenders is Lavendula x intermedia, which is a hybrid between L. angustifolia and L. latifolia, however for hedges Lavendula denata (Lavandula stoechas) or French lavender is great as they flower for such a long period. Lavender comes in many forms and is a very hardy plant. Aromatic, long flowering and a great hedging plant. 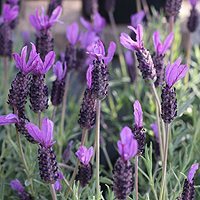 Best grown in a sunny position in a humus rich well drained soil, lavender can be planted from autumn right through until early summer, or even later given some water until established. Lavandula ‘Sidonie’ is a hybrid, ‘bred in Australia’ and is a variety best suited to warmer climates. The best time to plant is is early autumn or in early spring, the soil is still warm, or warming up so you will get some root growth. You will not need to water a lot, and the plants should be established before the heat of summer. As for fertilizer, these plants do not usually require a lot of fertilizer, however that will depend on the soil, a slow release fertilizer in early spring is a good idea. Mulch at the same time. Although this is a plant that will grow in containers it is happiest in the ground. Fertilize every 12 months in spring for great results. Lavender plants are fairly long lived, around 10 -15 years before they need replacing. Regular pruning will increase the useful life. Pruning is easy and is best carried out starting when plants are still young, to encourage bushy growth. In general, prune the plant back by 30% in spring. Dentata species require little pruning at all except for a tidy up after flowering. Lavandula allardii, augustifolia, canariensis, dentata, heterophlla, intermedia, lanata, latifolia, minutolii, multifida, officinalis, pinnata, pubescens, rotundifolia, stoechas and viridis. Choosing the best Lavender for your garden will depend on what you want from the plant. The usual requirement is landscaping however other uses are also important. Lavandula angustifolia ‘Munstead’ – This is a smaller growing plant with good purple flowers, it will also often repeat flower. Also available in a dwarf variety. Lavandula angustifolia ‘Hidecote’ – Another smallish plant deep blue to purple flowers. Lavandula pedunculata ‘Princess Lavender’ – Long flowering, low growing and very easy to prune, excellent i containers as well as in the garden. Lavandula angustifolia ‘Folgate’ – This one is suited for weaving into wreaths and bouquets. L. x intermedia ‘Grosso’ with its long stems is a favourite for cut flowers. For production of Essential Oils. L. angustifolia ‘ Maillette’ is the one used widely in perfumes and considered the best. L. x intermedia ’Super’ has a high oil content.